Brad K. Blitz, Senior Fellow at the Global Migration Centre, Geneva explains that new data show that large swathes of the European public want their governments to show more solidarity with refugees, but instead the EU-Turkey deal has paved the way to mass detention. Last week an asylum appeals committee in Lesbos upheld the appeal of an asylum seeker who had been one of the first Syrians listed for deportation under the terms of the EU-Turkey deal. The decision affirmed what many human rights commentators have been saying, that “temporary protection which could be offered by Turkey to the applicant, as a Syrian citizen, does not offer him rights equivalent to those required by the Geneva convention”. The committee’s decision put a halt to further questionable practices that saw Syrian refugees, including pregnant women, returned from Greece to a remote detention camp in southern Turkey where they were denied access to lawyers. The Lesbos committee decision, although positive, now raises many questions about the fate of asylum-seekers in Greece who cannot be lawfully removed and for whom detention appears to be the only alternative. Most at risk are the estimated 8,000 refugees and migrants who have been housed in the reception centre in Idomeni, which the Greek authorities are now trying to close. To date, most of those slated for deportation have been housed in closed detention centres on the Greek islands. These have been described as sub-standard, to say the very least. On 19 May, Human Rights Watch issued a report following its visits to centres on Samos, Lesbos, and Chios, which recorded that not only had the police failed to stop incidents of violence against women and children but that facilities in all three centres were overcrowded, with significant shortages of basic shelter and filthy, unhygienic conditions. The same criticisms have been levelled against unofficial centres in Idomeni and elsewhere in Greece. Such reports should not be surprising and yet they still continue to shock. Rather than advancing human rights protection as the European Council promised, the EU-Turkey deal has become a licence for abuse. While it has successfully deterred migrants from crossing the Aegean, it has also laid the ground for mass encampment. The return function, the other part of the compromise agreement which promised limited refugee relocation, has proven remarkably problematic – to date, only 390 people have been removed from Greece to Turkey. The circumstances surrounding their return, however, paint a disturbing picture of repression and subversion. Even before the ink was dry on the EU-Turkey deal, press reporting from Chios exposed a series of exploitative practices. Refugees were lured to pay for private transport to centres where they remained, without information about their rights, until Greek authorities figured out what to do with them. Then, on 4 April, as the international media watched, 202 migrants were returned on three ships to Turkey. A further 124 people were removed a few days later to the Turkish town of Dikili. Many of the unsuccessful asylum-seekers returned under the EU-Turkey deal were never given the chance to appeal against the lightning fast negative decisions they received, as required under international law. Others have remained in the closed centres in a legal no-man’s land. For several weeks, Amnesty International has been reporting on the ways in which both Greece and Turkey have used the cover of detention to circumvent international law in order to contain and remove unwanted migrants. South Asians have topped the list of unwelcome migrants, including large numbers of Afghan asylum-seekers. Once removed from Greece, Turkey has housed refused asylum-seekers in EU-funded removal centres, the first step in their transit back to Afghanistan. For the first two months of the EU-Turkey deal, many feared that Syrians would face a similar fate of detention followed by forced return. We now know that up to a dozen unlucky Syrians were removed from Greece while others languish in condemned centres. Immigration detention is nothing new. Despite widespread criticism by human rights authorities, immigration detention is commonplace. Throughout the developed world a mix of state and private authorities have created a flourishing business to keep asylum-seekers out of sight, often in locations off the grid. However, in both Greece and Turkey, immigration detention is especially challenging for asylum seekers, not least because all of the durable solutions advocated by the UNHCR – local integration, voluntary repatriation, and resettlement – now appear unfeasible and the prospect of lengthy periods of detention has become the only identifiable alternative. This year alone Greece has received 155,975 arrivals by sea. It hosts an estimated 50,000-90,000 irregular migrants, the vast majority of whom come from refugee producing states. In addition to the pressure of numbers, potential claimants in Greece have been disadvantaged as a result of an overloaded legal system where courts are backlogged; lawyers have been on strike, some 300,000 cases are outstanding, and previous negative judgments by the European Court of Human Rights have yet to yield reform. How could Greece process thousands of new claims for asylum, many asked? The situation in Turkey is even more precarious. With more than 2.7 million refugees across the country, Turkey has become an essential partner for dialogue with the European Union. Yet this is not a simple partnership. In addition to the demands made by an increasingly assertive government in Ankara, Turkey still maintains geographical restrictions on the types of refugees it is prepared to offer protection, at the expense of non-Europeans including Syrians, Afghans, Iraqis and Africans. The growing evidence of border violence, shootings and other attacks on refugees, interceptions, and forced returns to Syria further undermines the suggestion that Turkey is a safe host country. It was never supposed to be like this. In April 2015, the European Union launched an ‘Agenda on Migration’ and held out the promise of large scale refugee relocation. The creation of ‘hotspots’ near sites of arrival became central to the European Union plan for collective processing of migrants in order to assess claims of persecution and need for humanitarian protection. In this context, further promises of cooperation from Turkey were made on the basis that migrants’ rights would be respected. The party line is that reception is a neutral process. Migrants’ claims are assessed and if they have a prima facie case for asylum, they may apply from a reception centre. If not, their case should be rejected, and only after an unsuccessful appeal they may be removed. In practice, however, the process is not neutral and the whole system is fraught with political considerations. Key among these is the categorisation of need. While some groups such as Syrians are considered unequivocally to be in need to protection, for others such as Afghans and Eritreans, it is less clear cut. In March, the Upper Tribunal of the Court of Appeal of England and Wales ruled that it was safe to return Afghans to Kabul, even if other parts of the country were unsafe. Then, on 20 May, the UK Home Office revised its country information report on Eritrea, removing guidance on ‘illegal exit’ and ‘national including military service’, actions which are punishable in Eritrea. The deletion of this information, which had previously informed the assessment of asylum-seekers’ claims, may disadvantage Eritreans who need to provide further evidence of persecution in order to support their applications for asylum. Moreover, we know that the success of asylum claims turns on the way in which evidence is presented – that is why access to legal aid is so very important. Yet, those detained in Greek and Turkish centres must ask for information about their rights; the burden falls squarely on them. There is no uniformity of practice and both states are interpreting international law to reclassify migrants and deny them basic rights. Such improvisation has allowed Greece and Turkey to return people who might otherwise qualify for asylum. Those who remain are often left destitute and in dirty and dangerous centres. To be fair, this practice is not limited to Greece and Turkey. Although under EU law all states must provide asylum-seekers with information about their rights and the asylum process, many do not do so in a consistent manner. This is one of the emerging findings our European Commission-funded project ‘INFORM’, which is examining the ways in which asylum-seekers in six EU member states obtain legal and procedural information about their rights. Our initial results have been affirmed by the Refugee Council report, England’s forgotten refugees: out of the fire and into the frying pan, which records that in the absence of information and support given to applicants post-decision, up to 9,768 refugees in the UK may be homeless. In the case of Greece and Turkey, the dire situation has been aggravated by the lack of humanitarian infrastructure. The shift towards repression, one might argue, has been influenced by the demands of a powerful donor in the form of the European Union, which has determined the choices available to both host states. But this is one very narrow understanding of how political decisions are made and public opinion data in both countries and in fact across the European Union tell a very different story. Interests are more fluid than one might imagine. We know this to be true in the negative. After the attacks in Paris, Cologne and Brussels, there is greater reported hostility to both refugees and immigrants in France, Germany, and Belgium. In response all three countries introduced at least temporary border controls. However, there is also evidence pointing in the other direction that shows just how changeable the situation is. It is not just in Greece where the public has been overwhelmingly sympathetic to refugees. Before the terror incidents in Northern Europe, before the death of Alan Kurdi last summer, many of those sampled in the European Social Survey reported that their countries should be more generous towards asylum-seekers. Australia’s inhumane trend of off-shore processing illustrates just how little bearing multiculturalism or immigration history may have on the design of refugee policy. The release this month of Amnesty International’s Refugees Welcome Index, a survey conducted after the Paris attacks right up to the end of March 2016, supports this view. Using global survey data of more than 27,000 people in 27 countries, the Amnesty survey examined people’s willingness to let refugees live in their countries, towns, neighbourhoods and homes. The results show a high degree of not only sympathy but also hospitality towards refugees. Amnesty’s findings emphatically record that much governmental policy – the harsh line of exclusion – is out of sync with European public opinion. The divergence between ‘interest’ and public opinion further highlights two important points. First, refugees are not immigrants; second, not all refugees are deemed equal. Recent scholarship assumes that attitudes towards refugees are shaped by national immigration preferences with multicultural states being generally more sympathetic. That is of course an over-simplification. Indeed, Australia’s inhumane trend of off-shore processing illustrates just how little bearing multiculturalism or immigration history may have on the design of refugee policy. Moreover, the fact that China, a country with an historically restrictive immigration policy, should top the list of Amnesty’s Index as most welcoming towards refugees is further evidence that in practice people do distinguish between refugees and immigrants. States also distinguish between refugees. Take the example of Poland, a country with little experience of immigration and asylum and which presents such contrasting results. 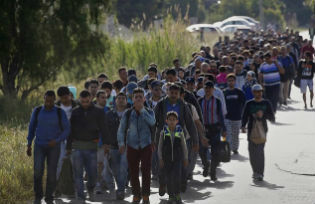 According to the 2015 European Social Survey, 63% of respondents in Poland believed their country should be ‘more generous’ towards refugees and a reported 56% of respondents in Amnesty’s Welcome Survey said they would let refugees into their country. Yet Poland has strenuously resisted taking in Syrians, the largest number of refugees arriving on the European continent. It has refused to participate in the EU relocation scheme and declared the European Council’s plan ‘dead’. So, how might we understand the level of public sympathy? One answer is that for those sampled in Poland, refugees are not understood to be Syrians, Iraqis, or Afghans but rather Ukrainians, people living in a neighbouring state not dissimilar to them. While immigrants are often selected on the basis of key criteria such as skills, family ties, and knowledge of the host language, no similar qualification applies to refugees and asylum-seekers whose only requirement for entry is a well-founded fear of persecution. Yet, the process of adjudicating claims of persecution leaves host states with considerable discretion to interpret political conditions in the claimant’s country of origin, as we saw in Greece prior to the Lesbos decision. Unlike the immigration system in many states, the process is not driven by measurable points or quotas but is highly discretionary in practice. Further, the influence of foreign policy also looms much larger over refugee policy. The International Rescue Committee recently released a video on the global refugee crisis that placed the blame for contemporary refugee flows from the Middle East at the door of the US-led interventions in Iraq and Afghanistan. Many would share this assessment. However, if foreign policy contributes to refugee flows, it also shapes humanitarian policy in ways which are notably different from immigration policy. As former UN staff and refugee scholar Gil Loescher demonstrates in his political history of the UNHCR, humanitarian policy is often determined by foreign policy interests, not domestic concerns over integration or labour preferences. That may explain why Afghans and Iraqis are now targets for removal and why their countries, which have received billions of dollars of investment, are now described as ‘safe’ even though large swathes of both states are patently unsafe. It is a cruel irony that as European Union member states recoil at the violence and accounts of persecution committed by the Islamic State and Taliban, they are nonetheless prepared to return people to these situations. The emerging picture is one where the universalist needs-blind logic of refugee protection is crumbling. Hannah Arendt, one of the most important thinkers to write about contemporary refugee flows, argued that it was ever thus. As long as states can create stateless people by stripping them of their citizenship, she argued, the idea of universal human rights rings hollow. Once people are placed outside a state of law, it is easy to round up, expel and eventually kill. While Arendt was preoccupied with Nazism, there is no question that as long as people must rely on the good will of third parties for their protection, they remain vulnerable to abuse. The tragedies of the Sabra and Shatila camps in Lebanon, where Palestinian refugees were gunned down in 1982; or where Rohingya refugees have been left malnourished in squalid camps in Bangladesh, or forced to board unseaworthy boats fleeing Myanmar, reinforce Arendt’s claims. We need states to protect people. Italian theorist Georgio Agamben suggests that exclusion is a natural expression of political power. States use emergency legislation to control populations. They do this, for example, through anti-terror laws or by placing asylum-seekers in detention centres to restrict their freedom of movement, international refugee law notwithstanding. The fact that hotspots in Greece and return centres in Turkey now operate under military control, in the absence of procedural guarantees, sustains Agamben’s argument. Both the European Union member states and Turkey have abrogated international law at the expense of refugee protection. Unable to secure the external borders of Europe from unprecedented arrivals, EU member states have justified the reintroduction of national border controls on the grounds they are faced with an emergency situation. The Western Balkans has followed suit. Fenced off from Macedonia and with the Aegean more actively patrolled by NATO vessels, Greece is now the largest reception centre on the European continent. The dreadful scenes from Calais where foreign nationals were exposed to infectious disease, sexual assault, and the separation of families in a no-man’s zone is now the reality in Greek reception centres, as documented by Human Rights Watch. This situation should never have been allowed to develop but no state was prepared or able to address it. The EU member states who forced the EU-Turkey agreement upon Greece and kowtowed to Erdogan’s demands – before legal assurances, judicial institutions, and external monitors could be put in place – must share responsibility for this humanitarian tragedy. Walls, fences and camps do not offer protection. They create vulnerability. All EU states and more importantly their populations know that on the other side of the wall are men, women, and children who crave safety. Now these people face an uncertain future in closed detention centres. In all likelihood they will eventually be returned to the places from which they fled. That’s how refugees become prisoners. We must resist this turn and press for alternatives to detention which respect the rights of refugees and migrants. Brad K. Blitz is Professor of International Politics at Middlesex University and Senior Fellow at the Global Migration Centre, Geneva. He is the author of Migration and Freedom: Mobility, Citizenship, and Freedom, Edward Elgar Publishing. He is also Principal Investigator on the ESRC funded project EVI-MED: Constructing and Evidence Base of Contemporary Mediterranean Migrations and Coordinator of the European Commission funded project INFORM: Legal and Procedural Information for Asylum Seekers in the European Union.